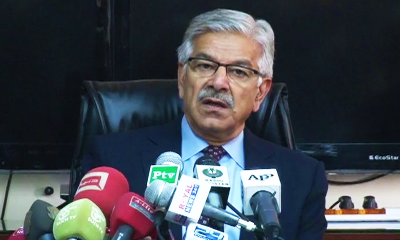 Islamabad (APP): Defence Minister Khawaja Asif has said that Pakistan will not accept any pressure on the Indus Waters Treaty (IWT) reached with India in 1960 for distribution of water between the two countries. “Each and every clause of the IWT should be followed by both the signatories in its letter and spirit,” he said while speaking to media after addressing a national seminar. The seminar titled “Hydro Politics around Pakistan:Reassessing the Efficacy of IWT,” was organised by the Institute of Strategic Studies, Research and Analysis (ISSRA) at the National Defence University (NDU) in Islamabad. Commenting on India’s latest move to build Ratle Dam on River Chenab after Baglihar and Kishanganga project, the defence minister said Pakistan did an extensive exercise in one and half years over the issue. “Pakistan’s case is stronger than that of India and we will safeguard our national interests at every cost,” he asserted.